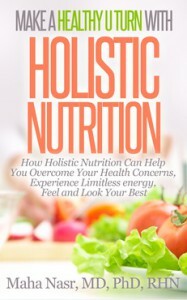 CONTACT YOUR HOLISTIC NUTRITIONIST IN OAKVILLE! Call us today at 416 876 4634 ! We are never too busy to help you. Maha Nasr, MD (Egy), PhD, R.H.N., ROHP, CPCC-founder and owner of Healthy U Turn- is an Oakville Registered Holistic Nutritionist and functional nutrition expert with a strong medical background. Dr Nasr runs a thriving holistic nutrition practice in Oakville serving clients all over the GTA including Toronto, Mississauga, Burlington, Hamilton, Milton and Brampton. We are conveniently located on the North Service Road West between the 3rd and 4th Line with excellent QEW exposure in Oakville and a short commute from Mississauga, Burlington, Hamilton, Milton and Brampton. Free parking is available at all times. Our mission is to empower health-conscious women (and men) who struggle with resistant weight loss and other chronic health issues to take back control of their diet and lifestyle and naturally maintain a healthy and fit body without deprivation or struggle. Thank you for your interest in Healthy U Turn’s Oakville holistic nutritionist services! We love to hear from you! Please fill out the form below and we will get in touch with you within 24 hours. Maha Nasr offers both in-person and phone/Skype holistic nutrition services.